It’s a good-news, bad-news day for the Red Sox, who are on the verge of locking up Xander Bogaerts through the 2025 season. SEATTLE — Omar Narvaez hit a three-run homer off Rick Porcello in Seattle’s seven-run third inning, and the Mariners beat the Boston Red Sox 10-8 on Sunday. Dee Gordon had two hits and three RBI as Seattle put together another impressive performance at the plate. The Mariners scored 34 runs while taking three of four from the defending World Series champions. The Red Sox did get some good news after the game, with reports that the team is close to an agreement with shortstop Xander Bogaerts on a six-year, $120 million contract that would start in 2020. Bogaerts is making $12 million this year and was due to become a free agent after the season. Boston’s starting rotation was hit hard in all four games against the Mariners, as each starter allowed at least six runs. Porcello gave up nine runs, four earned, and six hits in 2 2/3 innings. The 2016 AL Cy Young Award winner struck out three and walked four. Porcello, Chris Sale, Nathan Eovaldi and Eduardo Rodriguez combined to give up 22 earned runs in the series, and none made it past the fifth inning. Jay Bruce also homered for Seattle, and Mitch Haniger had two hits and two RBI. The Mariners have 15 homers so far, hitting at least one in each of their six games. The Red Sox almost came back in the ninth for the third straight game after rallying for a win Friday night but falling one run short Saturday night. Cory Gearrin came in to pitch for Seattle and walked the bases loaded with one out. Gearrin was then replaced by Chasen Bradford, who walked pinch hitter Blake Swihart to force in a run before retiring Christian Vazquez and Jackie Bradley Jr. to end the game. J.D. 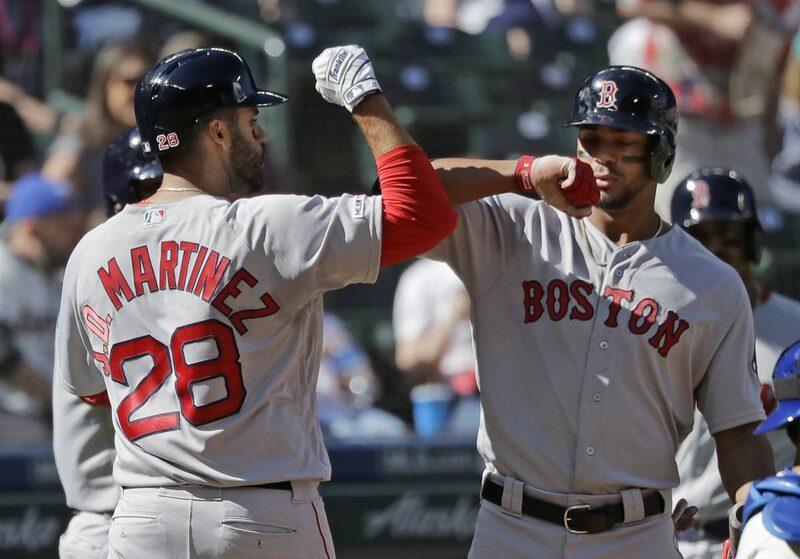 Martinez hit an RBI single in Boston’s three-run first, then belted a three-run homer in the fourth for his 1,000th career hit. Mookie Betts hit his first home run of the season in the sixth. Red Sox: Second baseman Dustin Pedroia (left knee) played in an extended spring training game. Red Sox Manager Alex Cora said Pedroia would play in another game on Tuesday before beginning a rehab assignment at Single-A Greenville. … Outfielder Andrew Benintendi was out of the starting lineup after fouling a ball off his right knee on Saturday. He walked as a pinch hitter in the ninth. Mariners: Closer Hunter Strickland, who was placed on the 10-day injured list Saturday because of a right lat strain, will likely be out for a couple months, Servais said.